The last month of garden tours have been full of inspirational design. It was such a delight to see how many people have converted their lawns and other water hungry plants through the creative use of succulents and drought resistant plants. Combinations of color brightened up containers and landscaping. It was also great to see how many people are now keeping backyard chickens! Before the heat of the summer takes over I tend to do alot of hand watering in the garden. Even though it takes considerably longer, because it really does no good to spray blasts of water in the direction of your plants, it has its benefits. When you hand water you tend to notice slight changes in your plants and even notice new visitors which will be the topic of the next post. Insect activity is in full swing so you will no doubt have similar calling cards left in your yard. 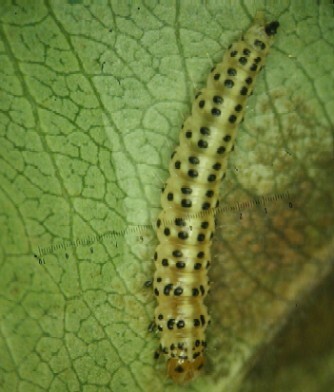 The pale green larvae of the vegetable leafminers adult form is a tiny fly that will lay its eggs on the underside of leaves. 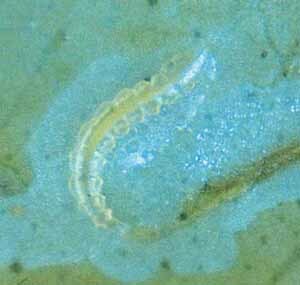 These tiny larvae can be spotted inside the tunnels they make which gives you an idea of how small they are. Not to worry though because the leafminer will rarely do enough damage to harm production. If the damage seems to be limited to a few leaves you can remove them which will limit spreading but if the damage is widespread the plant will still able to photosynthesize. The leafminer is also dinner for ladybugs and lacewings. I noticed while watering this eggplant seedling that it had lost the upper edge of it’s leaf. I looked for a nearby insect or slime trails and found nothing so I inspected the bite marks. The insect here only ate from the outer edge which meant caterpillar or grasshopper. On further inspection you can see that the entire leaf was a meal, veins and all. This meant we were looking at something with strong jaws. 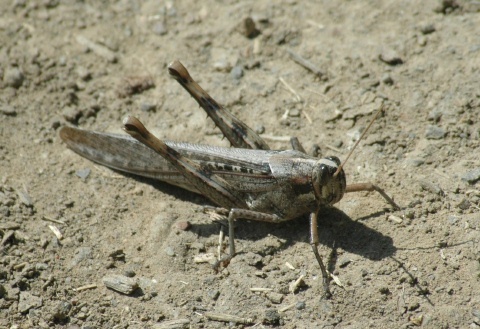 We were dealing with a grasshopper which everyone will inevitably find in the yard and they are unfortunately hard to catch. The more time you spend in the garden the more likely you are to inadvertently stumble into one as I have many times. Luckily the chickens prize this gourmet treat and make a fast disposal system. 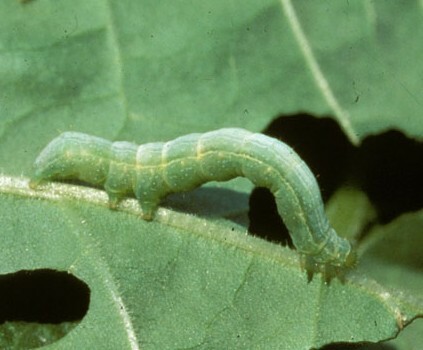 The Cabbage Looper caterpillar is thankfully very easy to spot and can normally be found on the underside of the leaves on the plant showing signs of damage. You can just pick them off and in our case feed them to the chickens who love these tasty treats (another great reason to keep chickens). You will want to provide a happy home for lacewings, ladybugs, solider bugs and wasps who dine on this insect. Also cabbage lopper is deterred by compact thyme which makes a great addition to the garden. This tomato has not been attacked by a virus or bacteria, instead it been discovered by skeletonizers. Skeletonizer damage can be distinguished by sunken in, chewed away areas of a leaf where the veins are still intact. There are many variations of this species whose moth form is also spotted in the garden. I easily controlled it by handpicking them off the leaves and the tomato has grown exponentially with no new damage. Keep in mind for most pest there is a predator and in order to lure and keep these beneficial insects we should not eliminate all of their food supply. Also if you take away one thing from this let it be that the only spray I utilized was a hard blast of water and most damage on plants, up to 20% of the plant above ground, will not harm production. Any mysterious damage has you stumped? Email us at info@seedsinthecity.com and we will get on the case.